The release of the world 's first smartphone with whole display installed is imminent. 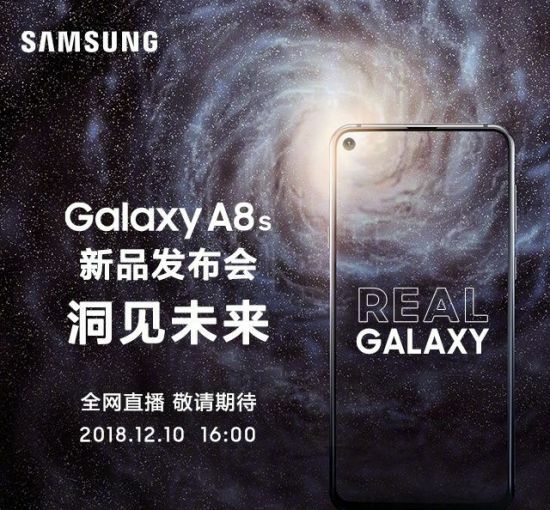 According to related industry officials on the 10th, Samsung Electronics will show Galaxy A8s in Beijing, China at 4:00 pm on this day. Samsung Electronics plans to broadcast live events through the Samsung Electronics website in China. The most prominent feature of the Galaxy A8s is the 'Infinity O' display. Infiniti O is one of several display designs released at the Samsung Developers Conference (SDC) last month, with holes for self-cameras in the upper left corner. Before Samsung Galaxy A8s unveiled, the company also pre-screened detailed photos on the Wafer. The diameter of the hole for the self-camera is known to be 6.7mm. Samsung Electronics invented Infiniti O to realize "bezel-less design" with minimal border and margin. It is expected to further enhance the user's immersion feeling than Apple's "Notch" display. Notch refers to the design with a pitted upper center. Besides, the Galaxy A8s have a screen size of 6.39 inches and an aspect ratio of 19.5 to 9. The brain is equipped with Qualcomm Snapdragon 710. Rear triple camera, single front camera. The triple camera consists of 24 million, 10 million, and 5 million pixel lenses. RAM and memory capacities are 6GB and 128GB, respectively. The battery capacity is about 3400 mAh, and it supports USB type C port and audio jack. 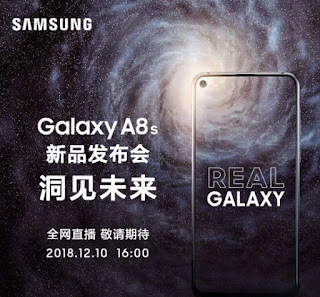 Samsung Electronics will release the Galaxy A8s in China this month. It is a strategy to check the performance of high-end Chinese phones such as Huawei, Xiaomi and Oppo. Samsung Electronics is currently struggling with its share of 0 ~ 1% in China due to local manufacturers. However, China is the largest market for smartphones, so Samsung hesitates to withdraw. The domestic release date has not been decided yet. Meanwhile, Huawei plans to release Nova 4, a mid-range phone equipped with a whole display. Galaxy S10 Unveils... Rival of iPhone X? Unveiled Before Sanfrancisco Release Galaxy S10, Full Screen Except for Lens Samsung Electronics (005930) leaked images of the Galaxy S10 and FolderBoard, which are scheduled to open in San Francisco, US on May 20 (local time). On the 1st, Twitter user Lean Ben Gaskin, an expert on the leakage of mobile devices, released an official image of Galaxy S10 · S10 Plus in his account. According to the 'Infinity O' display, which is filled with the front screen, only the upper camera hole is left. There is one camera on the front of the left Galaxy S10 and two cameras on the Galaxy S10 Plus. On the rear there are three cameras horizontally. There are three colors of white, green and black. According to the German media Win Future, blue color will be added in the future, while the Galaxy S10's entry-level model will also offer yellow color. Amazon Moving Into Medicals? "Home Health-Examination Market"
"Secret project group" "Code name 'Picard' aims sales to 250 million by 2020"
A special secret project group at Amazon is considering developing a product that allows individuals to carry out health screenings at home, a CNBC source reported on Thursday. In this case, Amazon will expand its business to healthcare. According to two other sources, Amazon also considered acquiring a diagnostic venture company called Confer Health. Confer Health has developed hardware that can measure home-acquired infections such as pregnancy and strep throat. This hardware is designed to make hospital-level diagnostics without a doctor. The official said Connie would have been the right place for a medical diagnostic project that the Amazon Special Secret Projects group had been actively pursuing in the past summer. The project group is from Google and is headed by Baz Pawbys, who moved to Amazon in 2014, and he says he is very interested in home health-testing.